Whisper it quietly, but Russians might be defecting from vodka. Peddlers of the popular firewater say they have seen a slow but perceptible shift in tastes - away from the traditional shooting of vodka chased with herring, toward the gently sipped smoky aromas of Scotch whisky. 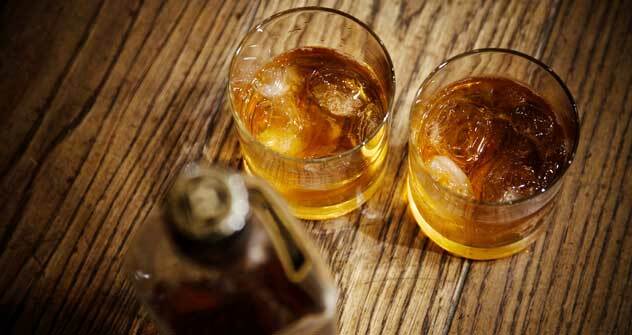 "Gin is down, tequila is down, cognac is static, but whiskey imports are growing. It was the only spirit to continue to grow during the crisis, and it accounts for about two-thirds of all spirit imports," said Erkin Tuzmukhamedov, a leading sommelier and the country's leading whiskey lover. Industry insiders say even sales of vodka have begun to fall, while recently proposed excise tax increases could facilitate second thoughts about vodka. Russia's traditional second spirit, cognac, is stagnant. So, could whiskey really be the new vodka? Of course, whiskey, and especially scotch - which comes from Scotland and many consider its most genuine incarnation - is doing well everywhere. Exports of scotch rose 12 percent in 2010, earning Britain ?2.8 billion ($4.5 billion). Those in the business have long known that whiskey has never been a hard sell in Russia, says Ludovic Ducrocq, a long-serving international ambassador for Grant's whiskey who visits Russia every couple of years. "I actually find that countries with a strong history of distillation are usually more responsive to Scotch whisky, and this is especially true of Russia," he told The Moscow Times in e-mailed comments. But there's still a mountain to climb to assail vodka's supremacy. Russia is the world's largest overall spirits market - it consumed 275 million nine-liter cases in 2009, according to the Edinburgh-based Scotch Whisky Association. Only 11.6 million of those cases, or 4.2 percent, sold in 2009 were imported foreign spirits. Domestically produced vodka accounted for 229 million cases. Scotch whisky winds up with a share of just 0.5 percent of the world's largest market for hard drink. Russia is only the 32nd-largest export market by value for Scotland - direct whiskey exports were worth ?19 million. So it is no surprise that marketing managers in Edinburgh see "significant room for growth" here. One reason is that whiskey is genuinely new to Russia. When the global craze for Scotch began to take off in the late 19th century, Imperial Russia was largely insulated by a state monopoly on alcohol. That isolation continued after the 1917 Revolution. For the next 70 years, the Soviet public had two legal choices of legal spirits: vodka, and French-style cognacs mostly from the Caucasus. Whiskey wasn't exactly unknown in the Soviet Union. The party elite could enjoy imported Ballantines, and Tuzmukhamedov recalls being able to procure a liter and a half of Teacher's during his student days - for an exorbitant 40 rubles. But Russians really only discovered whiskey en masse after Boris Yeltsin lifted the state monopoly on alcohol in 1992. "It was a glamour thing. You watch a Hollywood film, and everyone's drinking whiskey; you read Western literature, everyone's drinking whiskey. We'd never had it before," Tuzmukhamedov recalled. What started off as an expensive novelty and status symbol has become one of the staples of the local alcohol diet. In the past 10 years, sales of imported spirits have grown 40 times in size, driven by rising incomes and the growth of the middle class, said Vadim Dobriz of the Russian Regional and Federal Alcohol Markets Studies Center, an independent drinks market analyst. It is very much reliant on the relative growth of incomes over the past decade. "To be truly a drink of the people, a spirit shouldn't be selling for more than 200 rubles [$7] for a 70-centiliter bottle," Dobriz said. "You're not going to find any whiskey in Russia for less than about 350," he added. And the novelty has kept it ahead of rivals like gin, rum and tequila. "It's not my aim to ask people to drink whiskey instead of vodka. Both may be enjoyed on different occasions," said Ducrocq from Grant's. Dobriz attributes a large part of whiskey's popularity to drinkers - especially women - who see little appeal in knocking back entire shots of vodka and are yearning for an alternative. "Women don't like vodka; they want something with flavor that they can sip. So you'll find female drinkers are a significant part of whiskey's success," he said by telephone. Today, the Russian market in many respects resembles the rest of the world. As elsewhere, the market is dominated by Scotland, and the most popular brands are blends - largely because they're cheaper than single malts. The biggest-selling single malts are Glenfiddich and Glenlivet - respectively the largest and second-largest producers of malt whiskey in the world. White Horse, Famous Grouse and William Lawson, which sell for up to 500 rubles for a 70-centiliter bottle, led the pack in the lower-range segment in 2010. The most popular premium blends - usually aged about 12 years - include Johnny Walker Black Label, Chivas Regal and Dewars. But there are peculiarities. Irish whiskeys have a disproportionately strong presence because Jameson was one of the first brands to enter the market, in the early 1990s. And apart from Jack Daniels, which is as ubiquitous here as anywhere else in the world, North America is sorely under-represented. "It's difficult to get a decent bourbon here," Tuzmukhamedov noted. Tuzmukhamedov has played probably a greater role than anyone else in the popularization of whiskey. He's published six books on spirits, four of which are on whisky in particular, and is currently working on a book about hangovers. In addition, as a former ambassador for Dewars he was paid to promote the drink in Russia. Today he runs a whiskey academy in Moscow, Dolya Angela, or The Angel's Share, where he offers one-week courses in the history, production and appreciation of the drink. But he admits it is still difficult to untangle genuine preference from affected taste. "If someone says to you 'I only drink Macallan,' that's probably 90 percent pure pretension," Tuzmukhamedov said. Certain North Caucasian politicians and their entourages are said to go through a lot of Chivas Regal on their Moscow trips because they consider rivals like Johnny Walker to be too heavily promoted - and therefore probably of inferior quality. In Tuzmukhamedov's opinion that's not the conclusion any sane person would arrive at using their taste buds. "But there are genuine whiskey appreciation societies in Moscow, St. Petersburg and Yekaterinburg. I've met ordinary guys who save their money to go on holiday to Islay - that's not affectation, that's appreciation of the drink," he said. But it can be hard being a whiskey lover with broad tastes. Moscow bar owners tend to charge companies "access fees" to sell their brand; in exchange, producers demand exclusivity, with the result that most bars will not carry rival drinks from the same market segment. That means it is only the richest whiskey lovers who can enjoy a real choice. The best whiskey bar in Russia in Tuzmukhamedov's estimation is called Churchill and is located in Yekaterinburg - built specifically by a local oligarch to get around this problem. Producers are also stymied by what they see as excessive regulation. In particular, this year the Federal Alcohol Market Regulatory Service is reviewing importer's licenses. It has openly said it wants to reduce the number of license holders by half. Foreign booze peddlers are afraid that may be a thinly veiled effort to manage the market and favor some distributors over others. The Scotch Whisky Association has already complained that many of the regulator's new conditions are "unreasonable if not impossible to meet." It's a complaint their colleagues in Russian alcoholic beverage firms understand. People who work in the industry like to joke that the industry regulations are so arbitrary that ex-army officers and KGB veterans are their best managers - since they are used to dealing with absurd rules and apparently meaningless changes in instructions. "Regulations change four or five times a year. They say if you can hang on at the top of a Russian drinks company for four or five years, you could think about running for president," Tuzmukhamedov said. "The pressure they are under is unbelievable." One dreaded regulation requires importers to present four bottles of a product for "certification" before it can be cleared for import. That's obviously problematic if you want to sell high-end, limited edition whiskeys of which there might be only 500 bottles ever produced. To make matters worse, Finance Minister Alexei Kudrin in March unveiled plans for a fourfold increase in the excise tax on alcohol by 2014. The proposal would raise the excise duty to 900.90 rubles per liter of pure alcohol. For consumers that would mean a tax increase on half a liter of vodka and other hard spirits from the current 46.20 rubles to 180 rubles. But regardless of the difficulties, Russian distillers are acting on their optimism about whiskey's popularity. In February, Alliance 1892, a Kaliningrad-based spirits producer, signed a deal with Scottish suppliers to import and bottle its own blend at its Kaliningrad plant. Dubbed "Seven Yards," the new blend will take on Famous Grouse and White Horse in the economy segment. The Praskoveiskoye winery and cognac distillery in Stavropol advertises a three-year-old whiskey aged in oak casts that "combines centuries of Irish tradition with the experience of Praskoveiskoye's cognac masters." And in 2008 the Whiskey of Russia firm decided it could combine Scottish know-how with Caucasian spring water to produce a malt it will call "Kizlyarski," after the district of Dagestan the distillery is based in. The first batch is still aging, however, and will not be on the market for sometime. So we've still sometime to sip imports before we see a real Russian whiskey.